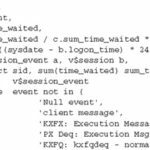 Part 1 of this article explored common causes of the Oracle db file sequential wait event. In this part, we explore how to tune for this wait. Optimize the SQL statement that initiated most of the waits by reducing the number of physical and logical reads. Reduce the average wait time. Unless you trace a session with the event 10046 or have a continuously running wait event data collector, it is difficult to determine the SQL statement that is responsible for the cumulated wait time. Take the preceding SID #192 again, for example. The 243113 centiseconds wait time may be caused by one long-running or many fast SQL statements. The latter case may not be an issue. Furthermore, the SQL statement that is currently running may or may not be the one that is responsible for the waits. This is why interactive diagnosis without historical data is often unproductive. You can query the V$SQL view for statements with high average DISK_READS, but then how can you tell they belong to the session? Due to these limitations, you may have to identify and trace the session the next time around to nail down the offending SQL statement. Once you have found it, the optimization goal is to reduce the amount of physical and logical reads. 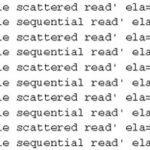 In addition to the DISK_READS column, the V$SQL and V$SQLAREA views in Oracle Database 10g have exciting new columns: USER_IO_WAIT_TIME, DIRECT_WRITES, APPLICATION_WAIT_TIME, CONCURRENCY_WAIT_TIME, CL USTER_WAIT_TIME, PLSQL_EXEC_TIME, andJAVA_EXEC_TIME. You can discover the SQL statement with the highest cumulative or average USER_IO_WAIT_TIME. Another thing you can do to minimize the impact of the db file sequential read event is reduce the AVERAGE_WAIT time. This is the average time a session has to wait for a single block fetch from disk; the information is available in the V$SESSION_ EVENT view. In newer storage subsystems, an average single-block read shouldn’t take more than 10ms (milliseconds) or 1 cs (centisecond). You should expect an average wait time of 4 to 8ms (0.4 to 0.8cs) with SAN (storage area network) due to large caches. The higher the average wait time, the costlier it is to perform a single-block read, and the overall process response time will suffer. On the other hand, a lower average wait time is more forgiving and has a lesser impact on the response times of processes that perform a lot of single-block reads. (We are not encouraging you to improve the average wait time to avoid SQL optimization. If the application has SQL statements that perform excessive amounts of single-block reads, they must first be inspected and optimized.) The db file sequential read “System-Level Diagnosis” section has some ideas on how to improve the AVERAGE_WAIT time. As you monitor a session and come across the db file sequential read event, you should translate its P1 and P2 parameters into the object that they represent. You will find that the object is normally an index or a table. The DBA_EXTENTS view is commonly used for object name resolution. However, the DBA_EXTENTS is a complex view and is not query-friendly in regards to performance. Object name resolution is much faster using the X$BH and DBA_ OBJECTS views. The caveat is that you must wait for the block to be read into the buffer cache; otherwise the X$BH view has no information on the buffer that is referenced by the P1 and P2 parameters. Also, the DBA_OBJECTS view does not contain rollback or undo segment objects that the P1 and P2 parameters may be referencing. A query as a picture instead of copyable text is pretty fail.